considered dangerous, as it eats mostly plankton. ﻿ A whale shark can look intimidating, but really, it's just an over-stuffed teddy bear. Even though it can grow to 41 feet and weigh 47,000 pounds, it has a bite akin to grampa without his dentures. 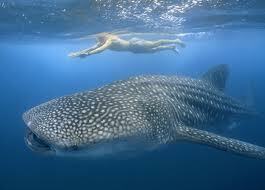 A whale shark has between 300 and 350 rows of tiny teeth. Emphasis on tiny. With those tiny teeth and large mouth, it is hardly a maneater. It feeds primarily on plankton by opening its mouth and filtering the food through five pairs of gills. So to hear that two fishermen in Australia got into the water with a whale shark and caught a ride on the beast isn't so alarming, though foolish nonetheless, as humans ought not interact with any wildlife. The men were tuna fishing off Moreton Island on Saturday when the whale shark approached their boat. According to Nine News of Australia, the whale shark swam with the men for around 20 minutes. Another fisherman in the boat shot video, the footage of which can be seen at this link to Nine News. It was almost as if the whale shark was posing for photos with the two fishermen. If ever there was a video to show how docile a whale shark is, this is it. That's called a butanding in the Philippines! I saw that poster on a wall at my sevierville dentist clinic. Is it true it doesn't bite? Pretty scary though.